Here is my good friend John. He is a major with the Swiss army general staff, a military judge, a bank auditor and the smartest negotiator I know. But the reason he looks so serious on my pictures is that he ripped a muscle while skiing last week. And yet he offered to accompany us and even carried the luges without a word. Don't let his stern look deceive you - John is a witty practical joker and great fun. That's John - a man of gold! We set out early for tourist-free ski slopes. 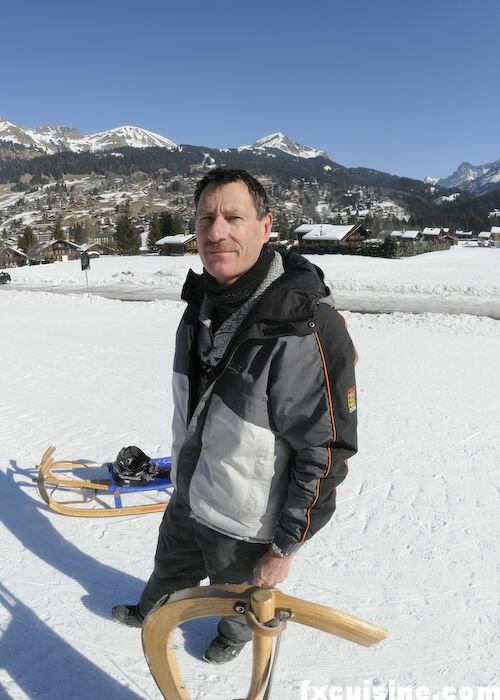 'The sledge run is closed today', explained the skilift guy. Disappointing news, but in fact the guy was joking with John, who paid him no mind and helped me secure the sledge on the lift. In a split second we are taken up in the air and soon sail above the treeline. The skilift takes us to a halfway station, then further up the mountain. 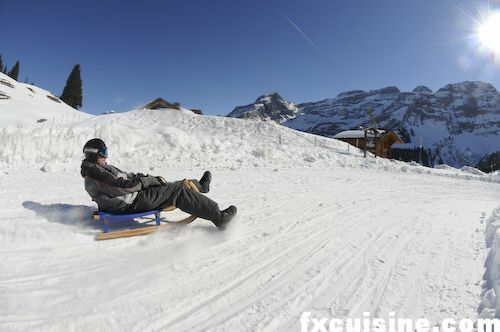 Who said luge was for kids? This is a seriously steep slope, and gravity is not on my side. Too late to chicken out. Off we go! I brake with my heels all I can, sending two whirlwinds of ice-cold snow into my lens. I ended up with icicles on my camera but hell, it said weatherproof on the box. John passes me over. He is not of the braking type and only digs a heel in the direction he wants to turn. Very fast! Now for the test of the brave. 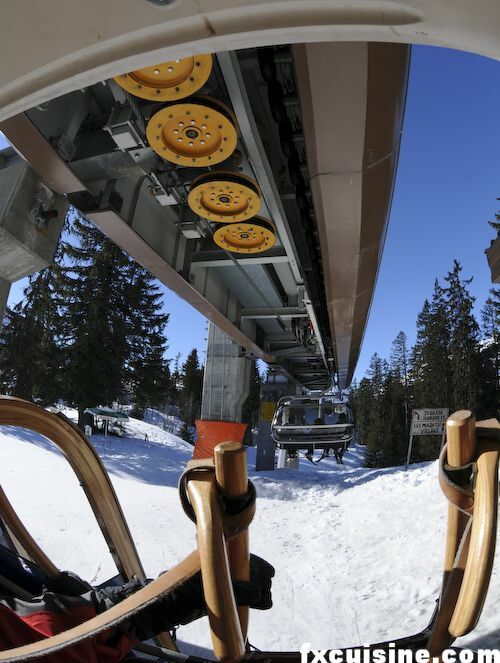 A large metal barrier closes the luge track so that pedestrians don't use it to climb the mountain. 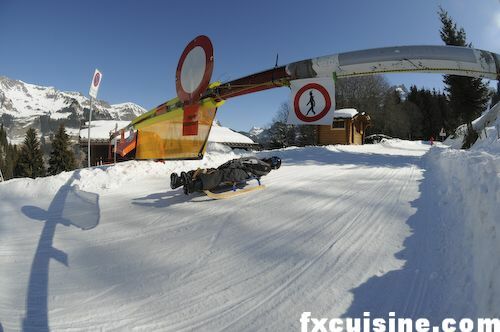 As you go down the track on your luge, you need to lay flat on your back to avoid crushing your head at full speed against the pole. My lens exagerates somewhat the barrier height - in fact it is really, really low. A doctor I know lost the use of his legs just after this barrier. One more descent, then we walk back to John's chalet for the culinary part of our little adventure. Christine, John's lovely wife, welcomes us and explains that the same morning she received a huge bottle of homemade apple juice from neighbors who made it with fruits from their orchards. 'They mix several kinds of apples to balance the flavour,' she explains. John serves me a glass - what a treat! We are at freezing temperature, I even saw the river fume this morning. And yet, here on John's beautiful wooden balcony, I start peeling off layer upon layer of clothing. Believe it or not, my snow-soaked pants start to steam as the water evaporates in the strong sun. All this is very nice, but after a day out in the great Swiss Alps, my only question is : What's cooking? 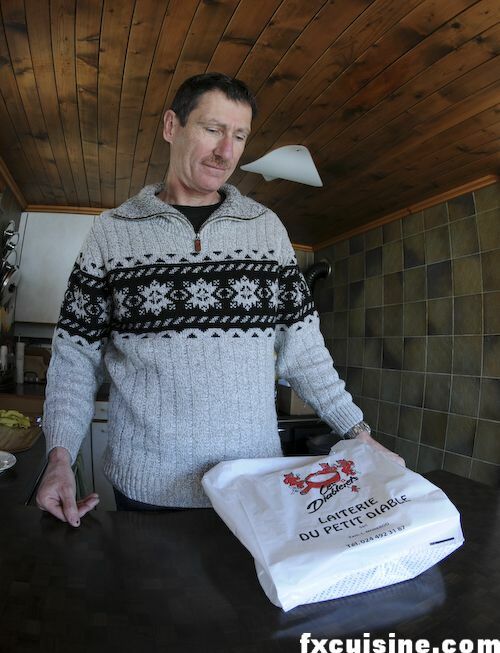 As I enter the kitchen, John is opening a bag from the local cheesemonger, La laiterie du petit diable 'the little devil cheesemonger', the best up there in Les Diablerets. As John cuts the grated cheese bag open, Christine explains: 'I went to the milk shop this morning. They grate the cheese fresh, half Gruyère and half Vacherin. Then they add a little cornstarch and seal it in the bag. John makes the fondue, me I never get it right!. Fondue-making in Switzerland is a bit like barbecueing - a matter best left in the able hands of the pater familias, the head of the family, the man. 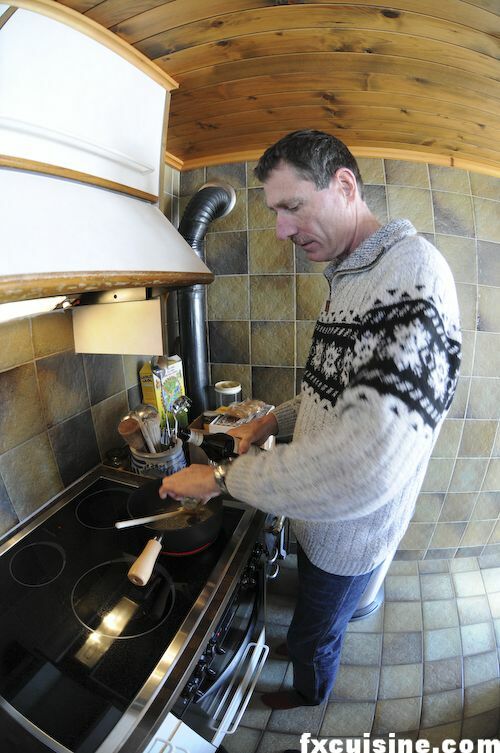 Most of us Swiss men don't cook, but we have a monopoly on grilling and fondue-making. It's a cultural thing. Now we start. John rubs a garlic clove cut in half all over the inside of his caquelon (crockware or cast iron pot). He heats it on medium high, leaving the cloves inside (some people take them out but this is really not a website for garlic haters), then pours a couple glasses of white wine into the pot. 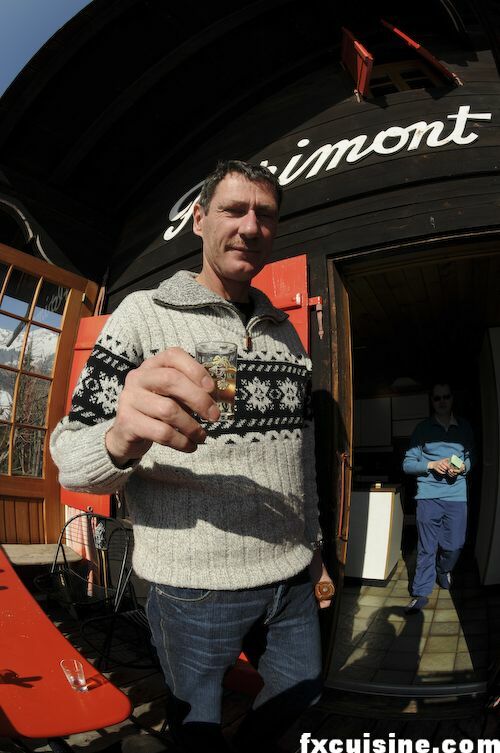 In Eastern Switzerland they make it with cider. The wine starts to boil. When the smell of alcohol disappears, he empties the grated cheese into the hot wine and mixes vigorously. A pinch of cornstarch (called Maizena in Switzerland and in many other European countries) will help the cheese fat mix smoothly with the wine. When a fondue 'splits', the fat makes a separate phase and nobody will eat it. There are a few fixes if this happens, but this is a real party pooper. 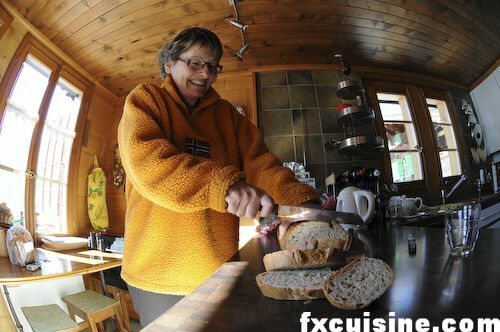 Christine cuts the bread in thick slices - 'Today that's my job! she explains merrily. The cheese is now fully melted and makes a smooth mixture. John keeps turning constantly. Christine pulls out a bottle of locally-made kirsch (cherry brandy) and John pours a glass into the fondue, mixing it in vigorously. That's it! The table is set, let's turn the heater on and bring the fondue pot. I am the first to try - delicious! Pepper. The custom is to ask all the diners whether they like pepper. If they do, the black pepper is freshly ground directly into the pot. If not, each guest makes small mount of ground pepper in his plate and rubs the cheese in it just before eating. Santé! To your health, we drink the remaining white wine. Melted cheese will play nasty tricks on your stomach if you drink anything but wine or hot tea. Try a coke to prove this wrong and you'll be sick. Bernard, a family friend who works for the Swiss Federal Banking Commission in Berne, brought a typical sweet - gingerbread with Bernese symbols on the icing - or is it a Bearnese dessert from Bearnard? 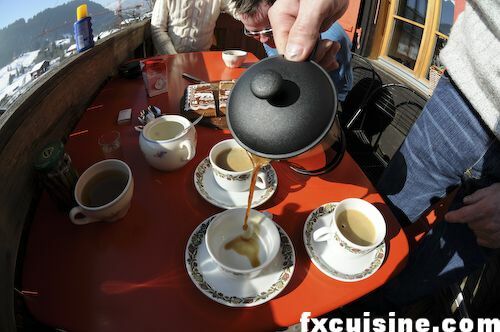 Coffee to help us cope with the fondue calorie shock. And finally my own contribution, a delicious artisan Panettone from Augnet in La Tour-de-Peilz I bought on the way. Conviviality, friendship and simple pleasures - another day in paradise! Thanks to Trice Bryan for her kind editing of my Swiss mountaineer's English! Wow, I would have loved to have been part of this excursion! The fondue looks amazing, and the gingerbread and panettone look great too! The only thing I wouldn't have indulged in was the luge, I'm a big chicken! Oh dear! 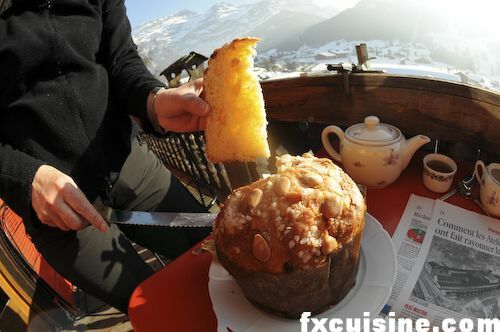 Bread, a Bernese (correct spelling) cake *and* panettone? You must be in a carbohydrate high! I leave the fondue making to He Who Must Be Obeyed...and I carve the bread. We have fondue once a week in winter when we are in the snow. I have to say that our cholesterol and blood pressure are low; maybe because of the wine and great outdoor exercise in the Alps. Yum! Adriana, thanks for your comment. The fondue was indeed amazing and so was the panettone! 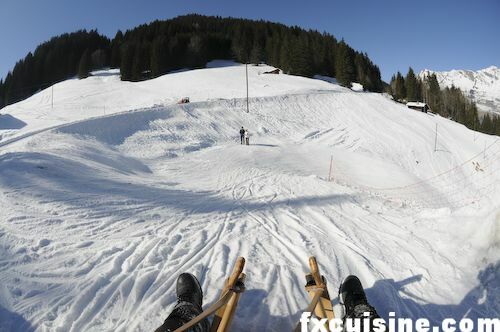 As for the sledge, you can proceed very carefully if you choose to, although it's difficult not to get carried away and then really hard to brake! Clive, this is really a fun sledge run! I'm told there is an even longer one up there in Saas Grund. You should have told me you were in town! Farmer, no need to be jealous if you consider the marvellous Oregon truffles! Beatrice, I think the carbohydrate was safely in check, at least in comparison with the huge amount of fat that was spread around the table on that day! 'Baernese' was a pun to try and convey the bearish origin of Bern. The city is named after its favorite animal and symbol, the bear (Bär in German). Johan, thanks for visiting! Yes you are quite right that indoor fisheye shots are a bit hard on the eyes. But wait until you see close up fisheye portraits! Oooh!! Droolsome! Cravings galore! 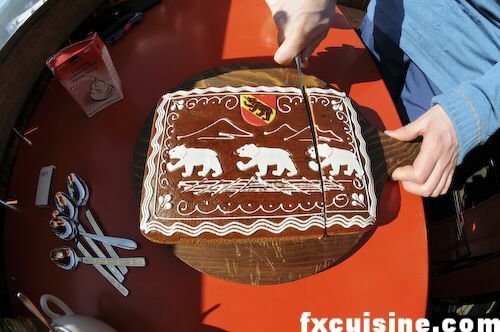 Can you make "bear"nese gingerbread, FX? 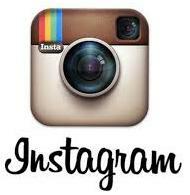 I grovel for a blogpost on it. 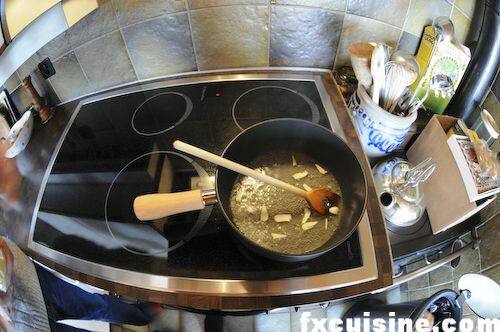 Btw, I actually like the fisheye shots, since they give a view of the kitchen. Wow, yet another great post. I envy you the excursions that you go on...around here public transport to get out of the city is not so easy, and between that and my light pocketbook, well, no lugeing in the alps for me! Someday I hope to make it there, in the meantime I have your wonderful blog to turn to! Thanks Alys, you are right, although white wine is as cold as the soft drink you cannot safely drink with the fondue, the alcohol somehow makes it work fine. How that is, I don't know, but if you try otherwise you'll be badly sick. I'm not surprised cider works fine. Thanks Ariun, I got a little carried away with my fisheye but am glad you liked the shots! I'll look into the gingerbread, it is not particularly good but is a nice looking Bernese specialty. Lyra, thanks for visiting! I am sure there are tons of nice things to do in DC too - the Alps is just one of many nice things on this earth. Funny, they call it Maizena in Venezuela too, hmmmmmmmmmm? Luci, thanks for visiting and hope you can make it to the Swiss Alps. 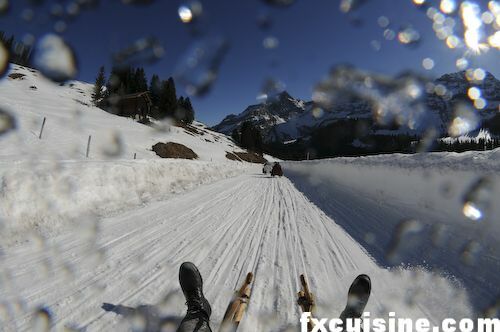 They rent the luge out for the day and in the summer there is no lack of things to do either! Magnificent article - love the photos. Was lucky enough to spend three years in Germany and visited Switzerland a few times (my favorite place - so beautiful). Made me 'homesick'. Thanks. Dolly thanks for visiting and glad this led you on the Swiss part of your Memory Lane! My cousin took me to Les Diablerets and fed me tonnes of fondue. Now I've gone all nostalgic and the fondue photos aren't helping. Oh, how I miss it. I hope to make my own now! 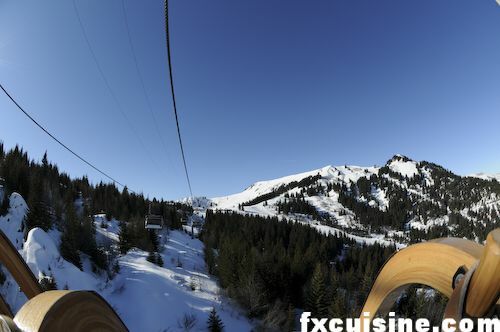 Physalia, thanks for visiting and I hope you'll get to eat another fondue in Les Diablerets before your time is up! Francois,viewed this swiss fondu many times-question,is there any reason that the cheeses are grated?Should I grate the gruyer and vacherin that I'm buying here in USA? I have to say you are very lucky in going to Switzerland. I was raised ther in Berne for 4 years brofee going to the United States. My father was a diplomat. I have been back often to visit friends and just reexplore with my son and wife. I have to say that of all the cities mentioned the least favorite would be Zurich. While it is a nice city it is not really what people think of Switzerland. I am biased toward Berne since I lived there, but I must say that it is a great city to explore. It is truly a beautiful city if you like old buildings, good food and excellent beer. On the down side though, in the past several years Berne has become more of a city with its increase in trash and graffiti.Last time we went ot switzerland we ventured out to a place called Kandersteg. It was wonderful and we hiked and walked everywhere. It was very old fashioned small town Switzerland. (the best) Food was excellent and the train runs in and out almost every hour. We stayed ata chalet called the Chalet Favorita which had 3 bedrooms, fully equiped kitchen, 2 bathrooms and a dining/ living room. What a wonderful place. I found it on . Another great site would be . Many Swiss cities and towns have there own web sites to help you through. 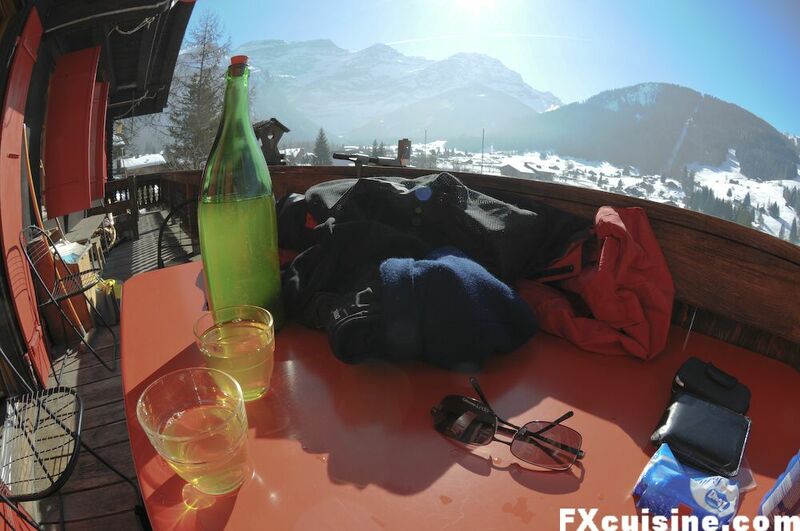 If you go for any length of time consider renting a house or chalet. It is much cheaper and more enjoyable. Chalet Favorita was about 900.00 dollars for 10 days. Geneva is also a beautiful city although different that the German side of Switzerland. There are many wonderful site there to see not the least is the fountain. If oyu do not speak much french the people of Geneva certainly speak english well. A word of advice. Try to learn at least the basic Please, thank you and good day in the language. It will get you a much bigger smile and probably more help. I really hope you enjoy.